In the first part of this article, I spoke about the history, types, composition and mechanism of denture adhesives. In case you missed it, you can check it out here. In this part, we will cover various factors that influence the use of denture adhesives. During denture insertion, by improving the retention in patients with compromised denture bearing areas. It also helps the patient to adapt to new dentures. It is a useful tool for patients suffering from dry mouth due to systemic problems like Parkinson’s disease, etc. They aid in retention of maxillofacial prosthesis like obturators, etc. Fixon denture adhesive powder – comprises of carboxymethyl cellulose with flavours. Fixon cream available in strawberry flavor – comprises of Gantrez MS, Sodium carboxymethyl cellulose, white petrolatum, aerosol. All three forms are easily available in the market and the patient may choose them as per their individual preferences. Denture adhesives can improve patient’s acceptance of comfort with dentures. They are an integral part of a professional service and their adjunctive benefit must be recognized. However, as in any other form of adjunctive therapy, there is an inherent risk of patients ignoring need for professional help when dentures become ill fitting. Therefore, denture patients should use adhesives on the advice of their dentists. They should also be instructed on its proper use and cautioned against its misuse. If you use dentures, you need to take extra care to maintain oral hygiene. 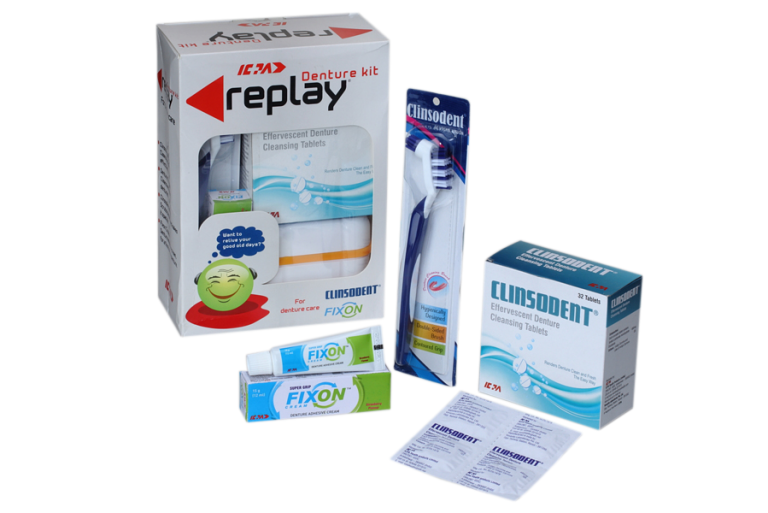 Denture management kits like the Replay Kit are perfect for comprehensive denture care. This kit includes Fixon Denture Adhesive Cream, a specialized Clinsodent Brush for effective brushing and Clinsodent tablets for denture cleansing. Kapur KK. A clinical evaluation of denture adhesives. J Prosthet Dent 1967;18:550-8. Stafford GO, Russell C. Efficieny of denture adhesives and their possible influences on oral microorganisms. J Dent Res 1971;50:832-7. Tarbet WJ, Boone M, Schmidt NF. Effect of denture adhesives on complete denture dislodgement during mastication. J Prosthet Dent 1980;44:1-8. Abdelmalek RG and Micheal CG. Effect of denture adhesive on palatal mucosa under complete denture. A Clinical and histological investigation. Dent J 1978;24:419-30. Kenneth AI. The use of denture adhesive as an aid to denture treatment. 1989;62:771-5.